Well, folks, it's been nearly a month since our last post which is far longer than we'd like. Brent's been doing a lot lately and has had plenty of music and video to share with you but little time to put together as well as he'd like. He is a bit of a perfectionist, after all, but also he's been very busy with other responsibilities. Brent recently performed as a guest member of the "modern chamber" trio, Fugue State. They did two shows together on Thursday, September 29th and then again on Saturday, October 1st. I ... that is, we had the post ready to go to promote the show on the 29th (as evidenced by the flyer to the left) when we lost our internet connection. But, at least, the show was being promoted elsewhere. All things considered, and in all honesty, Thursday's performance did not go very well, so don't feel too bad if you missed it. Also, Brent performed only two of his own songs - "Reality Down" and "Love's Sweet Song" - while mostly filling in as Fugue State's bass player and back-up vocalist. Fortunately, despite a rough performance on Thursday, the next show took place in the "sunny" south of Taiwan at Dulan's Sugar Factory (都蘭糖廠咖啡屋). 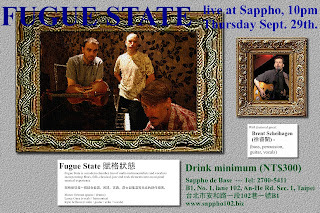 Finally, an unadorned version of the flyer got some use and was also promoted again on Gigguide, Taiwan. Not only that, but Marco, Kyle and Lance of Fugue state were determined to put on a better show and they did. This, despite a near constant rainfall throughout the weekend! We had a great time in Dulan and the folks who came out to see us had a good time, too. For example, here's a few ink drawings by local artist, Timothy-Nathan Joel, which he began during our performance. Brent opened the show with five of his own tunes; "The Mighty I", "Graveyard Blues (Not Another Day)", "No, I never", "Reality Down" and "Love's Sweet Song." Kyle, who has performed the latter tune with Brent many times was also joined by Marco on the drums. 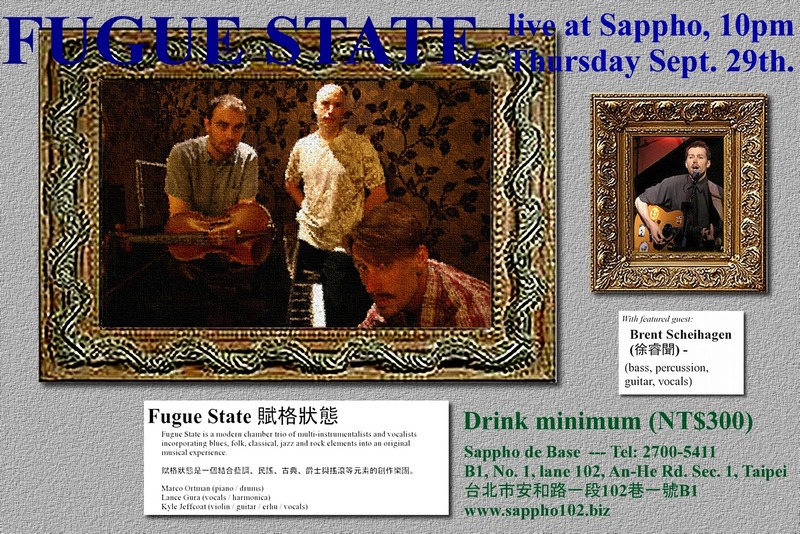 Fugue State featured an almost continual changing of instrumentation with Marco switching between drums and piano, Kyle switching between guitar, violin and erhu, while Brent occasionally played the djembe instead of the bass. Lance does most of the lead vocals for the group, but occasionally Kyle would take over the lead vocals and Lance would pick up a harmonica. Apart from original tunes, Fugue State performed covers of Public Enemy (! ), Leonard Cohen, Bob Dylan, Joy Division, Lou Reed and a Taiwanese song - "快樂天堂 (Mirthful Paradise)". Two songs were also performed with Dulan 98 hostel owner and musician, Barry Smith, including a Rolling Stones cover. Brent will perform with Fugue State again in the not too distant future with dates coming up in November and December. He's also hoping to perform sometime this month while his parents are visiting from the States. Also, look forward to some video from the show to be posted some time in the, hopefully, near future. In other performance news, Brent also recently performed with Terry Luan (aka Danger Young) for Terry's first full-length hip-hop show. Brent joined Terry for the first-ever live performance of a song they created together - "Discover Taiwan (探索臺灣)". We're hoping to put some video of the performance in the near future. In the meantime, Brent is back to work with Terry and Aaron on new music. We'll be sure to post it as soon as everyone's satisfied with the final product. In another related topic, to art and collaboration, we're happy to announce that Brent's father, Vin Scheihagen, has also established his own website. You can see much of the art that Brent has taken advantage of using for videos and in conjunction with an occasional post here on the website. Take a look at www.vinscheihagen.com. That's all for now from Hagen Music! Visit us on facebook to see a video from the recent Fugue State performance! See you soon!